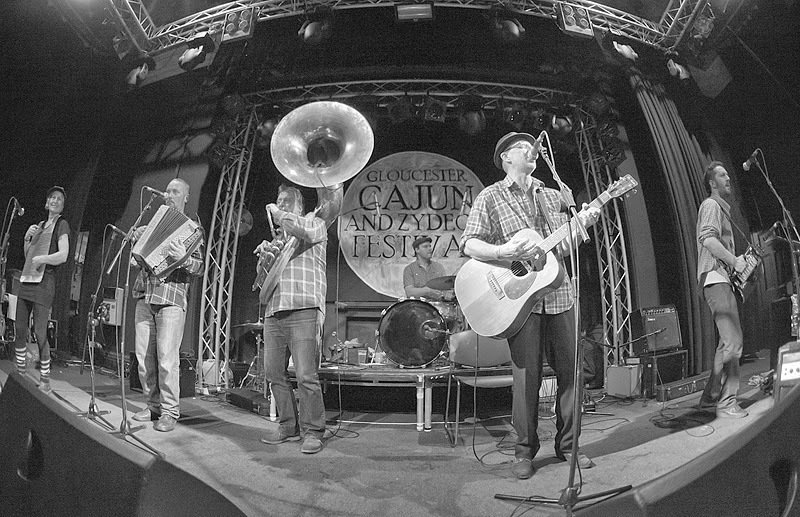 Hailing from Savoie in the French Alps, The Quepeux Brothers (Sauveur, Dan, Harvey and Advien), have been playing a rootsy brand of stomping cajun music ever since 2007 under the name Advien Quepeux and The Good Time Boys. Coming from a more electric and rock’n’roll background, they like the devastating energy of Bosco Stomp, and as Soul music and Rhythm’n’Blues fans as well, they love the plaintive sounds of Canray Fontenot’s stripped down fiddle playing. Without worrying too much about established conventions, they enriched their traditional set up with a sousaphone which gives them this unique stomping feel. In 2010 they released their first album « Le Côté Farouche de la Vie » on vinyl, co-produced by Ice Tune Records and Folkwelt (a world music label) and including 9 classic cajun songs and 3 originals. In 2011, after a fifth musician joined the band (Junior : melodeon, banjo, tifer), they released a second album on Folkwelt once again, with 21 songs, two of them featuring legendary cajun fiddle player Hadley Castille and his grand daughter Sarah Jayde Williams on fiddle and vocals. Advien Quepeux and The Good Time Boys just recently had to change their name to Advien Quepeux and The Good Time Friends after teaming up with female fiddle player and big time Cajun enthusiast Yanick from Ardeche of Maman Roulaille and Mme Sosthene fame (among others).